Changes to the climate could pose a "serious threat" to the UK rail network, scientists have warned. Extreme weather events - wet winters and hot summers - are projected to become more common over the next 50 years as a result of global warming. A new study, in the Quarterly Journal of Engineering Geology and Hydrogeology, predicts this could lead to more landslides and floods. The authors say the damage could cause "widespread disruption" to travel. To reach their conclusions, scientists from the University of Southampton and Network Rail studied the number of landslides and floods that resulted in delays of more than eight hours to rail travel. They found that the frequency of these major incidents was far higher during the wet winter of 2000-2001, when rail passengers experienced widespread travel disruption. Lead author Fleur Loveridge, a PhD student at the University of Southampton, said: "This is a really serious issue which needs to be addressed." She added one of the most "at risk" areas was the south-east of England, because much of London's rail network is built on soft clay, which is particularly prone to landslides. In a separate study by Network Rail, engineers concluded that half of the UK's 10,000km (6,000 miles) of railway cuttings and embankments were in "poor" or "marginal" condition, leaving them vulnerable to extreme weather events. Earlier this year, eight people were injured when a train was derailed between Glasgow and Oban as a result of a landslide following heavy rain. 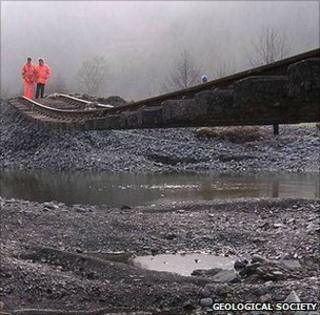 In another recent incident, 40 tonnes of rock blocked a Dorset railway line resulting in major delays. Ms Loveridge told BBC News: "Climate change in the near future is 'locked in' - it's too late to change that. "We need to raise awareness and increase maintenance budgets, as well as supporting research to develop innovative engineering solutions to tackle the problems before they happen. "Proactive planning for climate change adaption offers much better value for the taxpayer than bearing the huge costs when things go wrong." The UK government, in its Spending Review, announced that Network Rail would receive £14bn to support rail maintenance and investment.